Eurasian Black, Monk or Cinereous Vulture Aegypius monachus with offspring. Central Spain, June 1975. Meyburg, B.-U. & C. Meyburg (1981): Essai de tabulation sur les Falconiformes méditerranéens.Pp. 7-10 in: Rapaces Méditerranéens, Annales du Centre de Recherches Ornithologiques de Provence N� 1, Aix-en-Provence. Meyburg, B.-U. (1981): Décomptes de rapaces le long des routes en Ibérie. Pp. 44-47 in: Rapaces Méditerranéens, Annales du Centre de Recherches Ornithologiques de Provence N� 1, Aix-en-Provence (with an English summary). Thiollay, J.-M. & B.-U. Meyburgs (1981): Remarques sur l'organisation d'un peuplement insulaire de rapaces: Madagascar. (English summary: Organization of Madagascar raptors community). Alauda 49: 216-226. Meyburg, B.-U. (1981): Notwendigkeiten und Möglichkeiten des Populationsmanagements bei Greifvögeln. Ökologie der Vögel 3: 317-334. Meyburg, B.-U. (1981): Konferenz über den Habicht in Oxford. Ber. Dtsch. Sekt. Int. Rat Vogelschutz 21: 49-51. Meyburg, B.-U. (1981): Seltene und vom Aussterben bedrohte Greifvögel (III). Der Spanische Kaiseradler (Aquila heliaca adalberti). Der Falkner 31/32: 21-30. Meyburg, B.-U. (1982): Slow decline / La lente disparition / Das langsame Verschwinden/La lenta scomparsa. Naturopa N� 40: p. 26-28. Meyburg, B.-U. (1983): The World Conference on Birds of Prey in Thessaloniki. The Ring 11: 138-140. Meyburg, B.-U. (1983): Die Greifvogel-Weltkonferenz in Thessaloniki. Vogelwelt 104: 118-120. Meyburg, B.-U. (1983): The significance for captive breeding programms of fratricide and cainism in birds of prey. Intern. Zoo Yearb. 23: 110-113. Meyburg, B.-U. 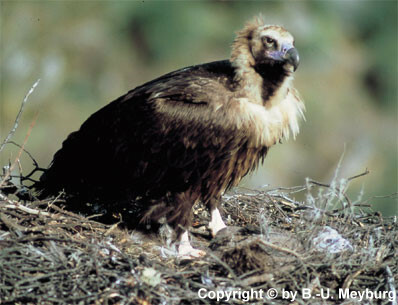 & C. Meyburg (1983): Vultures in Mongolia. Pp. 99-106 in: S. Wilbur & J.A. Jackson (eds. ): Vulture Biology and Management. Berkley, Los Angeles, London: University of California Press. Meyburg, B.-U. & C. Meyburg (1984): Distribution et statut actuel du Vautour moine (Aegypius monachus). Pp. 26-31 in : Rapinyaires Mediterranis II. (English summary). Barcelona: Centre de Recerca i Protecció de Rapinyaires. Meyburg, B.-U. 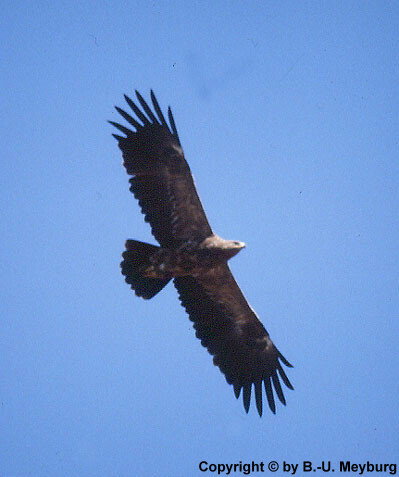 amp; O. Langrand (1985): Evolution, Verbreitung und Status der Greifvögel (Falconiformes) Madagaskars. (Résumé fran�ais: Evolution, distribution et statut actuel des rapaces de Madagascar; English summary: Evolution, distribution and present status of Birds of Prey in Madagascar). Pp. 193-205 in: Proc. Intern. Symp. African Vertebr., Mus. A. Koenig,. Bonn. Meyburg, B.-U. (1985): Management zur Anhebung des Greifvogelbestandes. (English summary: Management to Increase Raptor Populations). Acta XVIII Congressus Intern. Orn., Moscow, "Nauka", Vol. II: 683-693.